Fracking, or Hydraulic fracturing, is the propagation of fractures in a rock layer caused by the presence of a pressurized fluid. Hydraulic fractures form naturally, as in the case of veins or dikes, and is one means by which gas and petroleum from source rocks may migrate to reservoir rocks. This process is used to release petroleum, natural gas (including shale gas, tight gas and coal seam gas), or other substances for extraction, via a technique called induced hydraulic fracturing, often shortened to fracking or hydrofracking. This type of fracturing, known colloquially as a 'frac job', creates fractures from a wellbore drilled into reservoir rock formations. A distinction can be made between low-volume hydraulic fracturing used to stimulate high-permeability reservoirs, which may consume typically 20000 to 80000 gallons of fluid per well, with high-volume hydraulic fracturing, used in the well completion of tight gas and shale gas wells; high-volume hydraulic fracturing can use as much as 3 gallons of fluid per well. This latter practice has come under scrutiny internationally, with some countries suspending or even banning it. The first frac job was performed in 1947, though the current fracking technique was first used in the late 1990s in the Barnett Shale in Texas. The energy from the injection of a highly-pressurized fracking fluid creates new channels in the rock which can increase the extraction rates and ultimate recovery of fossil fuels. According to the International Energy Agency, the global use of natural gas will rise by more than 50% compared to 2010 levels, and account for over 25% of world energy demand in 2035. Proponents of fracking point to the vast amounts of formerly inaccessible hydrocarbons the process can extract. However, there remain large uncertainties in the amount of gas reserves that can be accessed in this way. Detractors point to possible Environment (biophysical)|environmental impacts, including contamination of ground water, risks to air quality, the migration of gases and hydraulic fracturing chemicals to the surface, surface contamination from spills and flowback and the health effects of these. In 2010 fracking industry generated $76 billion in revenues, and put the U.S. on track to possibly become a gas exporter. Because shales ordinarily have insufficient permeability to allow significant fluid flow to a well bore, most shales are not commercial sources of natural gas. Shale gas is one of a number of unconventional sources of natural gas; other unconventional sources of natural gas include coalbed methane, tight sandstones, and methane hydrates. 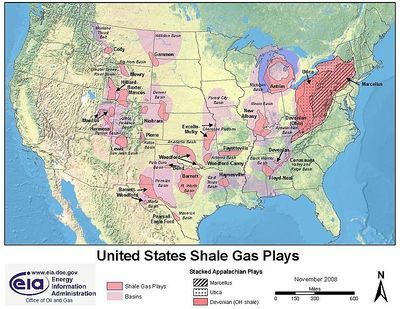 Shale gas areas are often known as resource plays (as opposed to exploration plays). The geological risk of not finding gas is low in resource plays, but the potential profits per successful well are usually also lower. Shale has low matrix permeability, so gas production in commercial quantities requires fractures to provide permeability. Shale gas has been produced for years from shales with natural fractures; the shale gas boom in recent years has been due to modern technology in hydraulic fracturing (fracking) to create extensive artificial fractures around well bores. Horizontal drilling is often used with shale gas wells, with lateral lengths up to 10000 feet within the shale, to create maximum borehole surface area in contact with the shale. Shales that host economic quantities of gas have a number of common properties. They are rich in organic material (0.5% to 25%), and are usually mature petroleum source rocks in the thermogenic gas window, where high heat and pressure have converted petroleum to natural gas. They are sufficiently brittle and rigid enough to maintain open fractures. In some areas, shale intervals with high natural gamma radiation are the most productive, as high gamma radiation is often correlated with high organic carbon content. Some of the gas produced is held in natural fractures, some in pore spaces, and some is adsorbed onto the organic material. The gas in the fractures is produced immediately; the gas adsorbed onto organic material is released as the formation pressure is drawn down by the well. Although shale gas has been produced for more than 100 years in the Appalachian Basin and the Illinois Basin of the United States, the wells were often marginally economical. Higher natural-gas prices in recent years and advances in hydraulic fracturing and horizontal completions have made shale-gas wells more profitable. As of June 2011, the validity of the claims of economic viability of these wells has begun to be publicly questioned. Shale gas tends to cost more to produce than gas from conventional wells, because of the expense of the massive hydraulic fracturing treatments required to produce shale gas, and of horizontal drilling. However, this is often offset by the low risk of shale-gas wells. A 2012 article estimated that the UK may have offshore shale gas reserves of 1000 cubic feet compared to UK gas consumption of 3.5 cubic feet per year. However the cost of extracting this gas with existing technology would be probably be more than $200 per barrel of oil equivalent (UK North Sea oil prices were about $120 per barrel in April 2012). North America has been the leader in developing and producing shale gas. The great economic success of the Barnett Shale play in Texas in particular has spurred the search for other sources of shale gas across the United States and Canada. 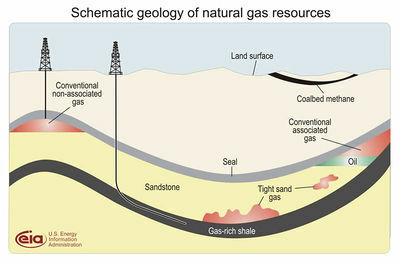 Research has calculated the 2011 worth of the global shale-gas market as $26.66bn. However, a June, 2011 New York Times investigation of industrial emails and internal documents found that the financial benefits of unconventional shale gas extraction may be less than previously thought, due to companies intentionally overstating the productivity of their wells and the size of their reserves. Oil production in North Dakota's section of the Bakken formation accounts for six percent of domestic production in the state and is largely responsible for reversing two decades of declining oil production. Currently North Dakota is running a surplus economy. According to the North Dakota Petroleum Council, crude oil taxes on production and extraction averaged 10.3 percent in 2010, bringing in $749.5 million in state revenues. Additionally, the industry spent $1.49 billion in taxable sales and purchases. In 2010 natural gas brought in over $10.1 million in extraction taxes. ↑ 1.0 1.1 Charlez, Philippe A. (1997). Rock Mechanics: Petroleum Applications. Paris: Editions Technip, 239]. ↑ Definition of frac job. Oilfield Glossary. Schlumberger. Retrieved on 22 February 2012. ↑ Anthony Andrews et al. (30 October 2009). Unconventional Gas Shales: Development, Technology, and Policy Issues (PDF), Congressional Research Service, ?. Retrieved on 22 February 2012. ↑ "World Energy Outlook 2011: Are We Entering a Golden Age of Gas?" (PDF), International Energy Agency (9 November 2011), pp. ?. Retrieved on 3 March 2012. "Based on the assumptions of the GAS Scenario, from 2010 gas use will rise by more than 50% and account for over 25% of world energy demand in 2035—surely a prospect to designate the Golden Age of Gas." ↑ Ian Urbina (28 January 2012). "New Report by Agency Lowers Estimates of Natural Gas in U.S.". Retrieved on 23 February 2012. ↑ Fact-Based Regulation for Environmental Protection in Shale Gas Development (PDF). Retrieved on 29 February 2012. ↑ Incidents where hydraulic fracturing is a suspected cause of drinking water contamination. U.S. NRDC (December 2011). Retrieved on 23 February 2012. ↑ Powell, Devin (24 March 2012). "Natural gas wells leakier than believed. Measurements at Colorado site show methane release higher than previous estimates" 181(6). Science News Magazine for the Society of Science and the Public. ↑ Susan Phillips (8 December 2011). EPA Blames Fracking for Wyoming Groundwater Contamination. StateImpact Penn­syl­va­nia. WITF, WHYY & NPR. Retrieved on 6 February 2012. ↑ Osborn, Stephen G. (2011-05-09). "Methane contamination of drinking water accompanying gas-well drilling and hydraulic fracturing". Proceedings of the National Academy of Sciences. doi:10.1073/pnas.1100682108. Retrieved on 2011-10-14. ↑ Investigation of Ground Water Contamination near Pavillion, Wyoming (PDF). U.S. Environmental Protection Agency. ↑ David Biello (30 March 2010). What the Frack? Natural Gas from Subterranean Shale Promises U.S. Energy Independence--With Environmental Costs. Scientific American. Retrieved on 21 February 2012. ↑ "Fracking brings boom, fears to rural U.S." Veronique Dupont, Mother Nature Network, April 22, 2012. ↑ Dan Jarvie, "Worldwide shale resource plays," PDF file, NAPE Forum, 26 August 2008. ↑ US Department of Energy, "Modern shale gas development in the United States," April 2009, p.17. ↑ Simon Mauger, Dana Bozbiciu (2011). How Changing Gas Supply Cost Leads to Surging Production. Retrieved on 10 May 2011. ↑ Ian Urbina (25 June 2011). "Insiders Sound an Alarm Amid a Natural Gas Rush", The New York Times. Retrieved on 26 June 2011. ↑ Urbina, Ian (25 June 2011). "Insiders Sound an Alarm Amid a Natural Gas Rush". Retrieved on 28 June 2011. ; Urbina, Ian (27 June 2011). "S.E.C. Shift Leads to Worries of Overestimation of Reserves". Retrieved on 28 June 2011. Hydraulic Fracturing Case Chart and Litigation Tracker, Arnold and Porter, 2012. 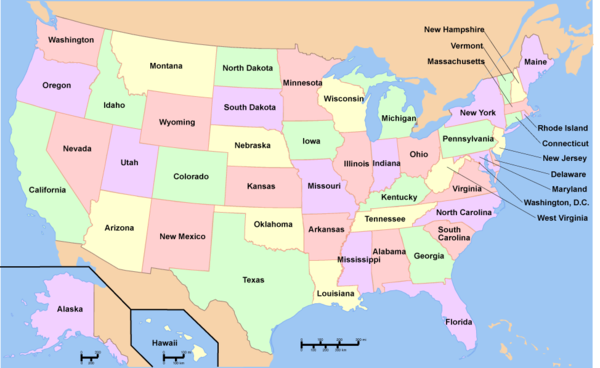 Wikipedia also has an article on United States and fracking. This article may use content from the Wikipedia article under the terms of the GFDL. This page was last edited on 26 February 2013, at 21:51.